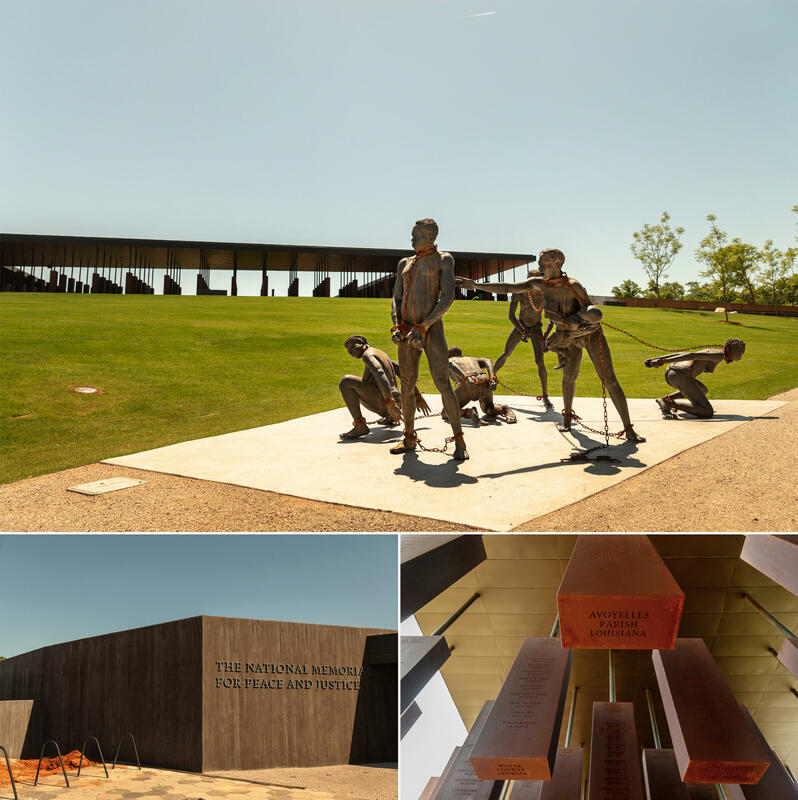 The National Memorial for Peace and Justice, opening in Montgomery, Ala., on Thursday, is dedicated to victims of lynching. Alabama Tourism Director Lee Sentell stands near the Civil Rights Memorial. Erected by the Southern Poverty Law Center in 1989, it was among the first monuments in Montgomery recognizing civil rights martyrs. Kwame Akoto-Bamfo's life-size sculpture of enslaved people in rusting shackles that evoke dripping blood is one of the first things visitors encounter at the memorial. The 800 monuments suspended from the ceiling each stand for a county where racial killings occurred. Victims' names are etched on each one. 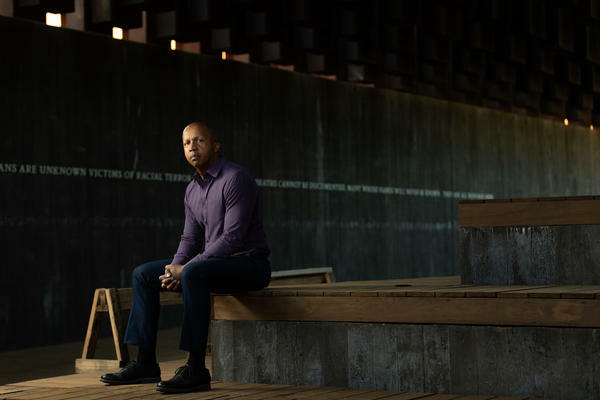 Bryan Stevenson, founder and executive director of the Equal Justice Initiative in Montgomery, sits in a reflective space at the National Memorial for Peace and Justice. 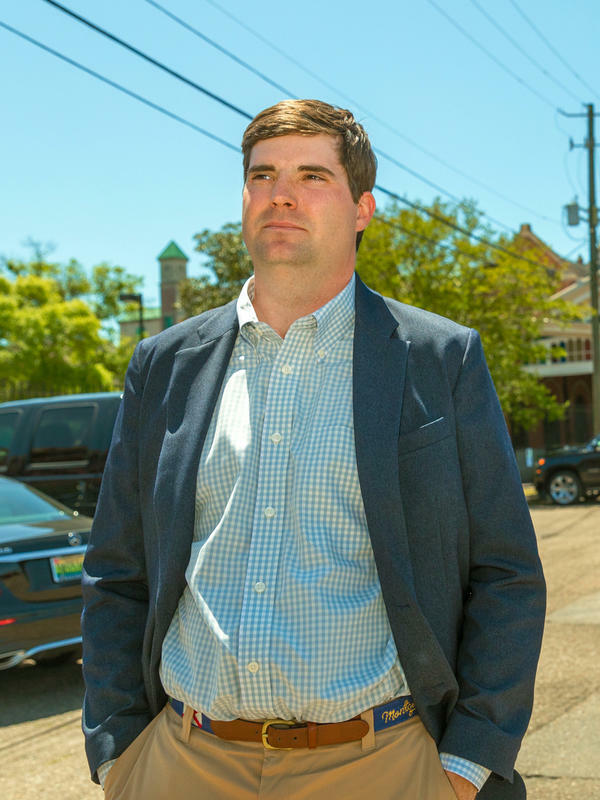 Clay McInnis, president of Montgomery's Downtown Business Association, says it's time for a reckoning. "I'm a millennial. I think our generation is ready for real and honest conversation," he says. "Do we want to get farther apart from each other or closer together?" 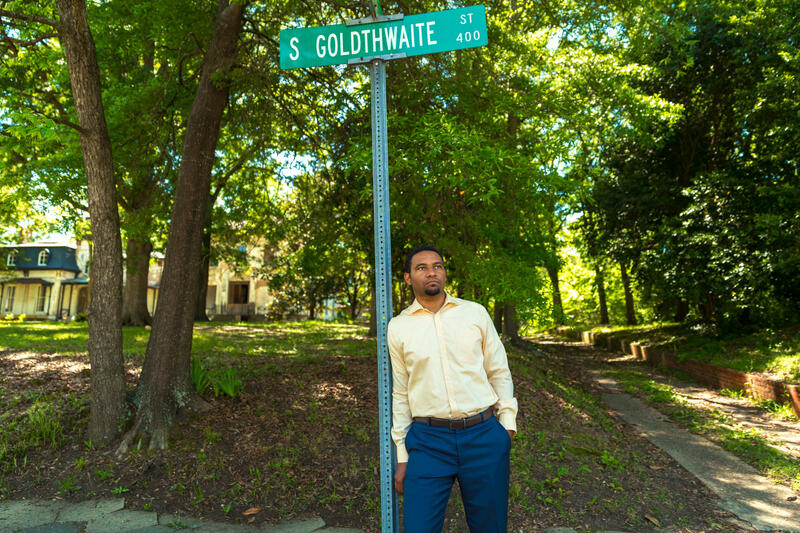 Justin Hampton is executive director of Common Ground Montgomery, a community development organization. He's standing near the site of an old plantation on a street that is seeing renewed investment near the National Memorial for Peace and Justice. Editor's note: This report contains language and an image some may find offensive or upsetting. The National Memorial for Peace and Justice stands high on a hillside overlooking downtown Montgomery, Ala. Beyond the buildings you can see the winding Alabama River and hear the distant whistle of a train — the nexus that made the city a hub for the domestic slave trade. And that's where the experience begins as visitors encounter a life-size sculpture in bronze of six people in rusting shackles, including a mother with a baby in her arms. "You see the agony and the anguish and the suffering in these figures," says Bryan Stevenson, founder and director of the Equal Justice Initiative, the nonprofit legal advocacy group that created the memorial. It opened Thursday. "It's people in distress," Stevenson says. "And I don't think we've actually done a very good job of acknowledging the pain and agony, the suffering, the humiliation, the complete denial of humanity that slavery created for black people on this continent." Stevenson serves as a tour guide through the somber space — which remembers the nation's history of racial terrorism, representing a journey from slavery to the period after the Civil War and before the civil rights movement. "No reconciliation without an acknowledgement"
The memorial houses 800 steel blocks, each 6 feet tall, suspended from above, and arranged in a square surrounding a grassy courtyard. There's a monument for each county where racial killings occurred, including one from Carroll County, Miss., "where nearly two dozen people were lynched," Stevenson says. They resemble elongated gravestones, etched with the names of victims. The Equal Justice Initiative has documented more than 4,000 "racial terror" lynchings — extrajudicial killings, often by hanging, for alleged crimes — in the U.S. between 1877 and 1950. People like Arthur Sinclair — a black minister lynched in Florida for performing an interracial wedding. 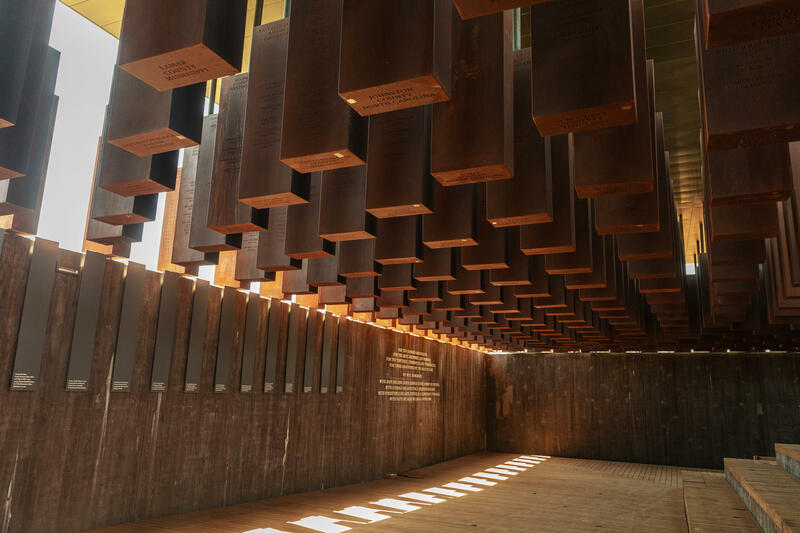 As you walk through the memorial, the orientation of the hanging monuments changes from eye level to overhead, evoking the way many lynching victims were hanged, often in public spaces. "They lifted these bodies up as a statement to the entire African-American community," Stevenson says. "They wanted to lift up this violence, this terror, this tragedy for others to see." He wants people to confront the brutality and be able to talk openly about it. "I think for many people of color they've had to endure the pain of this era, this history, in silence," Stevenson says. "It wasn't safe to talk about all of that anguish." The memorial seeks to change that — an ambitious and most uncomfortable endeavor, says local historian Richard Bailey. "America in general is not prepared for what they're going to see here," says Bailey, the author of a book about the Reconstruction era in Alabama. He says there remains a defensiveness about telling the full story of what happened during that period after the Civil War when white supremacists used lynching to enforce Jim Crow. There are dozens of markers or monuments to the Confederacy in Montgomery, but it was not until the 1990s that the fuller picture of the state's heritage was recognized, and even longer for some other Southern states. "There was not a historic marker of where Rosa Parks was arrested," says Lee Sentell, director of the Alabama Department of Tourism. "There was not a historic marker where John Lewis was beaten up as one of the Freedom Riders." "You're talking about two of the most significant movements in American history literally a block apart," says Sentell. "Most museums are somewhat objective and benign," Sentell says. "This one is not. This is aggressive, political. ... It's a part of American history that has never been addressed as much in your face as this story is being told." Stevenson acknowledges the experience will be painful to encounter, but he says there are models where the same thing happens, such as the Holocaust Museum in Washington and the Apartheid Museum in South Africa. "Why would you talk about the difficult past?" The Equal Justice Initiative is also opening a Legacy Museum that draws a direct line from slavery to lynching and to issues the country faces today, including mass incarceration. "There's a lot of conflict. There's a lot of tension," says Stevenson. "We're dealing with police violence. We deal with these huge disparities in our criminal justice system. You know, if everything was wonderful you could ask the question, 'Why would you talk about the difficult past?' But everything is not wonderful." The museum is downtown, in a building that was once a slave warehouse. "When people come in and they see the statement on the wall that says, 'You are standing on a site where enslaved people were warehoused,' it just puts a different consciousness in your mind of the connection and the history," says Sia Sanneh, a senior attorney with the Equal Justice Initiative. The first exhibit is a series of slave pens, where ghostlike figures speak from behind bars, telling stories taken from slave narratives about being separated from their families by slave traders. There's a wall constructed of jars of soil collected from lynching sites around the country. And representing the modern era, a replica of a prison visitation booth where you can hear a former inmate describe being on Alabama's death row for 30 years before his conviction was overturned. Both the museum and the memorial are being welcomed by the downtown business association. President Clay McInnis says it's time for a reckoning. "I'm a millennial. I think our generation is ready for real and honest conversation," he says. "Do we want to get farther apart from each other or closer together?" McInnis, who is white, is third generation in a family that exemplifies the forces that have shaped Montgomery — one grandfather was an ally of segregationist Gov. George Wallace; the other, a friend of Frank Johnson, the Alabama federal judge who dismantled segregation. "How do you reconcile that on the third generation?" he asks. "You have conversations about it." McInnis says EJI's new cultural spaces are a way of "putting our city on therapy, and our country." Along with the dialogue, the memorial has also served as a catalyst for activity in the surrounding neighborhood where historic homes had been deteriorating for years. "You can actually see the memorial through the trees here," says Justin Hampton, looking out a window on the second story of the circa-1900 simplified Victorian home he and his wife are renovating. Hampton is African-American and runs a community development organization. The house is on a street that was all-white when his mother was growing up nearby. "She would walk by; she would be called n*****," he says. "And would have rocks thrown at them." Hampton says his family living here is a turning point — part of the changing narrative. "It's told that slaves were actually walked up this street," he says, pointing to the plantation house at the end of the block. Hampton says that history and the culture of being separated by skin color have perpetuated. "The lifestyles we live are still segregated and siloed, especially in the South, especially in this city," he says. "So that leads to a continuation of the sort of patterns of access to things that have always been." 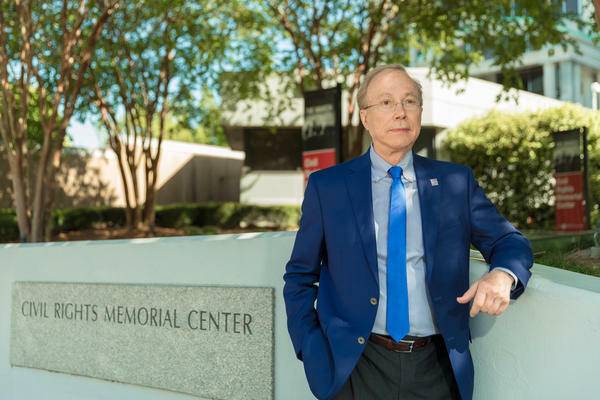 Hampton says it's time to face those demons, and the memorial can help both emotionally and with the physical transformation that's happening around it. "It's just a good feeling to know that you're a part of change," Hampton says. "On the front end of seeing some things happen in this neighborhood, and for it to be something that hasn't been. Not that it hasn't been — that it never was." The National Peace and Justice Memorial includes a section where counties can claim a replica of their lynching monument — to take home and start similar conversations throughout the country.